You can read the show notes and download the full episode here. which, you know, if you want to be able to just quickly get into development, you don't have to spend, you know, a lot of time just setting it up, you can get right into development, you know, kind of, from, from the first line code almost. Yeah, it's, it's very flexible. You know, it's hard to think of what kind of web development problem you couldn't solve with cold fusion. Maybe any listeners have an idea on that? Let me know in a comment on the show notes or drop me an email. It's interesting there, you say, you know, how you have successful in hiring developers to work on cold fusion? Because I know in our state of the confusion union survey, that was one of the top concerns that CIOs had, it's hard to hire good copy from developers. And you're saying you that's not a problem was you just hire good developers, and then spend a week or two training them to get up to speed in cold fusion? going in from cold fusion into some of those other languages, I think there's a little, it's a little bit different, because it's not just limited to the syntax, you have to there are, you have to do things in a very certain specific way in order to get your code to compile and work correctly. I just don't see cold fusion is being as rigid, some of those other languages that are much more friendly and easier pick up very shortly. Now, what would you suggest to give a devil's advocate position on that, you know, someone might be saying, Well, I'm not going to spend two weeks training someone to program and this I'll just hire someone who codes in Java? What, why is that not a smart way to look at it? effort how much reason to all of the tasks Java. So if you look at it up front, you know, maybe you're losing that week or two. But if, let's say, every task is going to take 10 to 15% longer, but they work on, you know, how quickly do you make up that time by, you know, having somebody do it, and cold fusion versus Java? maybe we should run a hackathon sometime, Brian, where we get some you know.net and Java or PHP and cold fusion developers and just give them a thing that could be done in a day. yeah, maybe we'll do that. Maybe instead of it being a throwaway epic, be some something that some charity or nonprofit needed deteriorating, and then it's something useful out there. So that you talked about the time to develop the app being quicker in cold fusion, compared to the to the other three languages? What about maintenance? so I don't think they have done is they will commercial now, right. Oracle? Java? for a developer. But if you're just somebody who's putting up a website, yeah, use a content management system, because you don't necessarily need to know the programming and I think that's probably a strong contributing factors to why cold fusion is not seen as, as playing on the same field as some of those other languages. That's not because the language itself is inferior, it's because the community, you know, hasn't necessarily developed products on it for the public to use, you know, on a widespread basis. cool. So maybe we should talk a bit about objects a bit more, you mentioned that earlier, but how does object reuse appear, you know, compare between these different languages. it's great to be able to have that, that kind of cascading functionality. And, you know, if, if confusion didn't make it so easy to be able to reuse those objects, and then reuse those objects, not only within the same code base itself, but then refer to that object from a different code base. cases for, you know, Adobe is really listening to what the developer community wants, or at least has been finger on the pulse of what the needs are the developers and so far as, you know, what do they need to make their job easy? 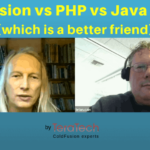 What do they need to do to make cold fusion, you know, better friends of developers. our developers, but their creative people, most of them are musicians, I'm a musician myself. And so we tend to think in a different way. you have to learn the way to do it. Right. As opposed to, you know, we kind of talked with cold fusion earlier, it's not that you have to learn to do with the cold fusion way, you just have to figure out what's the syntax to achieve this task with the cold fusion users. And I think that's really good. The big difference between the two. So it's almost like you're saying where that one of the reasons confusion doesn't get taught in schools and universities is, it's not complicated enough. and if anyone here is at us a high school or university just let you know Adobe has a whole curriculum for learning cold fusion that you can get for free just email Kishore Adobe and I'll stick his email down here and he can redirect the request and also the licenses for cold fusion universities and high schools if you're using a learning a free as well so assuming you're using Adobe cold fusion, obviously using the open source Lucy that that free to so I don't think it's any reason not to be teaching the stuff that you got the desire to do it. application, essentially, that we can integrate into our cold fusion app makes it you know, super simple to to work around certain security SSL authentication issues that happen from time to time, not necessarily a cold fusion problem, sometimes a Java problem, but it's it's nice to be able to use that as an alternative. service called postmark to deliver a lot of our business critical email. as a job board. We work with external vendors as well to import jobs. They provide an API writer services and cold fusion to import that data. It's actually really super simple and quick to be able to use in view, we use Twilio or Twilio to send out text messages. Again, another super simple, easy integration for us that was that, you know, we could set up as far as third party integrations, when it comes to, you know, actual add ons. to do that, in cold fusion, it was really simple, we were able to convert our files into a PDF format, add that watermark, and then send the PDF off to the client. really super simple, easy integration with you, there's, if you want to do that and.net, you got a fork of money. that's an important thing. So I, you know, it sounds overall, you know, you think on all these aspects, cold fusion comes out ahead. and it just doesn't seem to be that, you know, I don't necessarily see other people having that fervent dedication to whatever language they may be developing. I know guys who develop in multiple languages, and they'll be whatever, you know, the client requests, and it doesn't really matter to them. But I think, you know, when somebody works in cold fusion, they're always going to want to recommend cold fusion. Yeah, suddenly, a very passionate community, what I've seen at last year's summit or see if united or any of the other conferences around the world that they're now love the place, they just have to see a summit India will see up camp in Germany. So and of course, we've got into the box in use of Texas, see if somebody in DC, so lots of conferences and excitement. I'm curious your thoughts on cold fusion and security? it allows me to be need, you know, from a development perspective, it allows me to have my own style versus, you know, somebody else's created to I'm installing, which allows me to have more pride in the work that I actually do, I feel more connected to it, I feel more ownership of it. And, you know, I take more pride in in the tasks that I work on the features that result in my team. public recognition of, you know, large organizations that are using cold fusion on a daily basis as part of the mission critical apps, I think that right there would would help silence a lot of the critics of cohesion, his legacy you're dying, what did anyone say? that's you know, that that's happened consistently for the past several years for me and so you know, that's that's one of the things I enjoy the most you know, and getting to sit and talk and socialize and network with other developers and in cold fusion and see what other people are doing you know, that's that's great. Well, I really enjoy that. that probably via LinkedIn, I tend to use social or tend to use social media as more of a social thing. Not as much. yeah, it's been great talking to you, Brian, and really appreciate you coming on the show today.